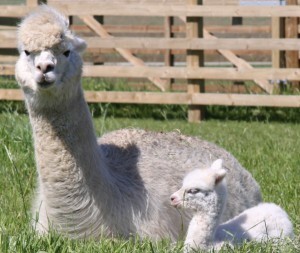 Nina was born on the 29th May 2009 to a dam that wasn’t well. Nobody could work out exactly what was wrong with mum Isis, but little Nina was booted out three weeks premature at 6.5 kilos. Nina thought that the tiny amount of milk that Isis was producing would be enough; wouldn’t look at a bottle of goats’ milk and because her dam was depressed and she was hungry all the time, she didn’t play with the other cria. After lots of medication for an ulcer, a scan of Isis’ liver and stomach diagnosed advanced cancer and within the lymph nodes, Isis died on July 13th 2009; read her story by clicking the link. Nina then changed from refusing a bottle of goats’ milk to being our most manageable bottle-fed baby in years. During August 2009 she took over a litre of whole goats’ milk a day, she didn’t care who gave her a bottle and she took hard food out of her own special bucket in the field. Her grandmother and mother’s characters were alwaysinquisitive, clever and bossy. 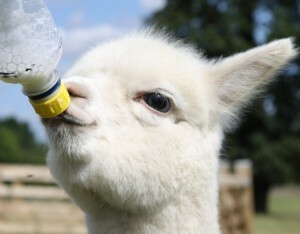 While drinking her bottle, if Nina felt that a cria was too close and might ‘steal’ her milk, she stopped to vigorously spit them away and then continued with her bottle. Nina is a born survivor.